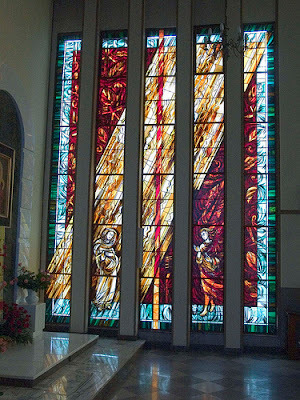 This stunning stained glass window is in Klarysew parish church, near Warsaw in Poland. It represents the announcement by the Angel Gabriel to a young girl called Mary that she would become the mother of Jesus. This story is told in Luke 1: 26 - 38. What used to be called 'Lady Day' is normally 25 March. This year that date was in Holy Week so the celebration of 'The Annunciation of our Lord to the Blessed Virgin Mary' is transferred to today 8 April. It's an old one, but a good one. Enjoy a little fun on 1st April!